A few useful tips on how to access your room on arrival. 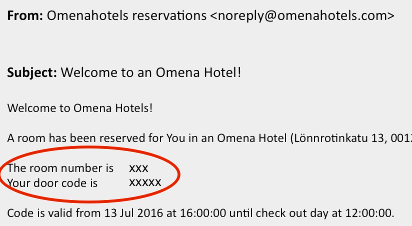 Omena Hotel has no check-in service and you don’t need a special key to get in to your room. 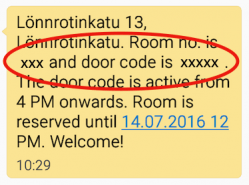 Instead, you will be issued a door code that opens the hotel door and your room any time after 4pm. Earlier access is regrettably not possible. Luggage hold facilities can be found at the railway station. Omena Hotel will send you the door code and room number by e-mail and SMS one day before arrival and in the morning of your arrival day. If you don’t find the e-mail, please check your spam folder. NB! If you have booked your stay through Booking.com, the confirmation PIN code sent by them is NOT the door code for Omena Hotel. If you need help, please call our customer service +358 600 555 222 (0.79€/min + local network rate) or use the lobby phone at the entrance of the hotel (free). Picking up the handset, the lobby phone will automatically connect to the client service. Our client service operates 24/7.